Bamboo blinds have a wonderful, earthy charm that can add a natural, tropical touch to any living space. Bamboo is actually a reed grass that is eco-friendly in nature and is an extremely cost-effective decorating option as compared to other pricier materials like timber. Here are some questions you may have about choosing, using and maintaining bamboo blinds in your home. How durable are bamboo blinds? Bamboo blinds are known to be extremely durable and last longer than many other materials such as timber. This natural material is resistant to deteriorating, fading or warping and has even been known to counter harsh weather conditions like intense sunlight or moisture. This makes them more durable in the long run and a fantastic alternative to timber, especially for wet area blinds. How do I clean my bamboo blinds? Bamboo blinds are very easy to clean and are rather low maintenance. Apart from an occasional cleaning, you don’t really need to pay much attention to them. You can use a small handheld vacuum cleaner or a floor model vacuum with a hose attachment to clean your blinds. If there is stubborn dust or any sticky deposits on your blinds, use a damp cloth with plain water to wipe them down. How do I choose bamboo blinds for my home? To choose the right kind of bamboo blinds for your home, take your decorating requirements into consideration and make sure each window space is consistent for a seamless look. You can choose between 3 types of bamboo blinds – custom bamboo blinds that are made-to-order, Roman shades, that fold as the blind is raised, and simple roll-up blinds that can be raised and lowered with the use of an exposed cord. 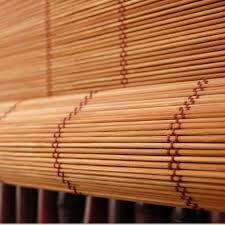 Yes, bamboo blinds are extremely eco-friendly as it is a natural material. It is a form of reed grass that is also known to be extremely renewable, making it one of the fastest growing plants in the world. New bamboo crops take the place of ones that are harvested almost immediately, unlike timber forests that take years and years to replenish. Is coloured bamboo available in the market? Yes, bamboo blinds are available in many different colors that you can match to the decor in your home to give it a seamless look. Bamboo blinds are a very versatile item and can look modern, clean and classic when you want it to, and beachy and tropical when the time arises. Do bamboo blinds have an insulating effect? Bamboo blinds stop heat from entering your home during the summer and retain heat in your home in the winter, thereby offering an insulating effect and even cutting down on utility costs. To give your home a tropical feel, check out the wide range of bamboo shades at Payless Decor. Next Post: Next post: Which eco-friendly car should you buy?